Denise Bourgon is hard to keep up with. She walks fast, works fast and thinks fast. “I’m always thinking about what I need to do next,” she says. Denise has been working in Food Services at the McGill University Health Centre for the past 24 years. She started off at the Montreal Chest Institute and was transferred to the Montreal Children’s Hospital in 2008 where she began working in the formula room. The formula room is not easy to find. It’s tucked away inside the kitchen on S2. 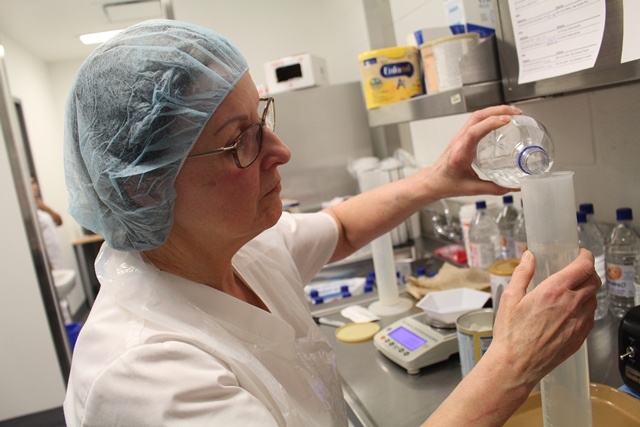 Small and tidy, the space has everything Denise needs to make specialized liquid formulas for newborn patients at the MCH, or for older pediatric patients with restrictive dietary needs. Denise starts off every morning reviewing her long list of daily orders. Each formula is tailored to the child’s nutritional needs and is accompanied by a recipe prescribed by an MCH nutritionist. Each specialized formula varies in complexity; some are liquid concentrate infant formulas diluted in sterile water, while others are in powdered form or ready-to-feed. “Some of the formulas I make are a combination of nine ingredients. Each recipe must be followed precisely in order to have the exact right amount of nutrients for every patient,” she says. “And for mothers who are breastfeeding, I prepare special concentrates they can mix in their breast milk.” Denise also prepares milkshakes or calorie-rich shake mixes, called Scandishakes, for children who need to gain or maintain their weight. Considering the number of new admissions a day, Denise is constantly reprioritizing and juggling her responsibilities. “I get called with a lot of different emergencies, so I’ve developed good judgment over the years in terms of what I should tackle first,” says Denise. 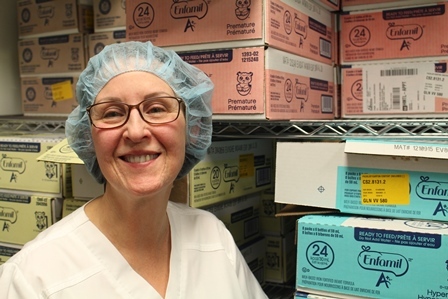 Besides preparation and delivery, she is also responsible for reviewing the formula room’s inventory list, checking expiry dates and restocking pre-op, the emergency department and the recovery room with ready-to-feed formulas.